This is a good thing on the roll back – the FCC had reclassified the Internet as a Public Utility, hence they could regulate via Title II of the Telecommunications Act to achieve this regulation. BPF’s concern is that state public utility commissions could take this as an opportunity / excuse to start trying to regulate Internet Service Providers (ISPs) at the state level. The net neutrality rules, while they sound good on the surface and make good talking points for politicians, are a classic case of government regulation where none is needed. The FCC (former Chairman Tom Wheeler) was basically doing President Obama’s bidding on this effort. It appeared Wheeler started out against supporting this, but jumped on the bandwagon after an Obama speech and huge White House effort to push it. It helps the likes of Google and Amazon while stifling the ISPs and investment. There are a bunch of politicians and lobbyist for the content providers running around stating “the sky is falling” if this roll back occurs, but most of it had not actually taken effect yet. (As we understand it, but there is some confusion or arguments around that point.) The FCC is supposed to be free of direct political influence, but as with most things in the prior administration, it was always political (i.e. IRS targeting of conservative Nonprofits) and the White House was directly pushing Net Neutrality. With the administration change, Tom Wheeler resigned and Ajit Pai, an existing Commissioner, was appointment Chairman (which did not require Senate consent). 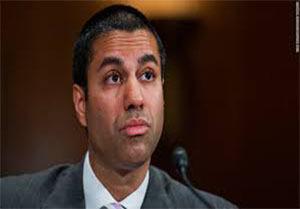 Typically, the FCC (while not supposed to be political) has 3 republican appointees and 2 democrats, but currently there are only 3 members – 2 republicans and 1 democrat. The FCC will get this reversed, but it will take some number of months as they now must follow the process with public notices, comments, open meetings, etc. In the meantime, it appears that the Commission is taking a step back and leaving things are they are – which is good.